Belfast-docked warship HMS Caroline could create "one of the most significant World War One commemoration projects in the world". The claim has been made by the grandson of the admiral who commanded the Royal Navy's Grand Fleet in 1916. 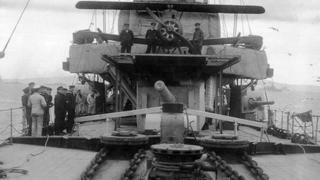 HMS Caroline has been docked at Alexandra Dock in Belfast since 1923. Plans to transform it into a floating museum are progressing. The fast light cruiser played a lead role in the 1916 Battle of Jutland in which the Royal Navy forced the German Imperial Navy to retreat to port. It is the last survivor of the battle. John Rushworth Jellicoe, commanded the grand fleet at Jutland. His grandson, Nick Jellicoe, made his first visit to Belfast last week to see HMS Caroline before restoration work begins. "If Caroline can help tell the story of just why Jutland was so important in the first place and tell it in a way that engages a younger generation and sparks new interest, then she will have served a very much higher cause," he said. "We have a chance to retell some chapters of history, not only of the battle but through her later role in the Royal Navy Reserves. "It is absolutely essential that a strong communications role be developed for Caroline in the upcoming World War One centenary commemorations and that she contributes and pays her way to helping the rebirth of Belfast through educational tourism." The National Museum of the Royal Navy (NMRN), which is now responsible for the decommissioned Caroline, has secured a National Heritage Memorial Fund grant of £1.1m to pay for repairs to prevent any further deterioration. A joint application by NMRN and the Northern Ireland Department for Enterprise, Trade and Investment for a major grant was submitted to the Heritage Lottery Fund late last year. This has resulted in a further £845,000 being made available as a round one grant to develop the plans further. If a round two application is successful £14m would be used to fully preserve, restore and open the ship to the public in time for the Jutland centenary on 31 May 2016. "I am very happy indeed that Caroline may be the way through which a whole generation can re-discover their history," Mr Jellicoe said. "Caroline played a significant part in a very significant battle but has also had a long, honourable relationship with Belfast so it is fitting that she remains there."